The Twins’ team hit a technology home run with the SPARCS visiting team this past October. 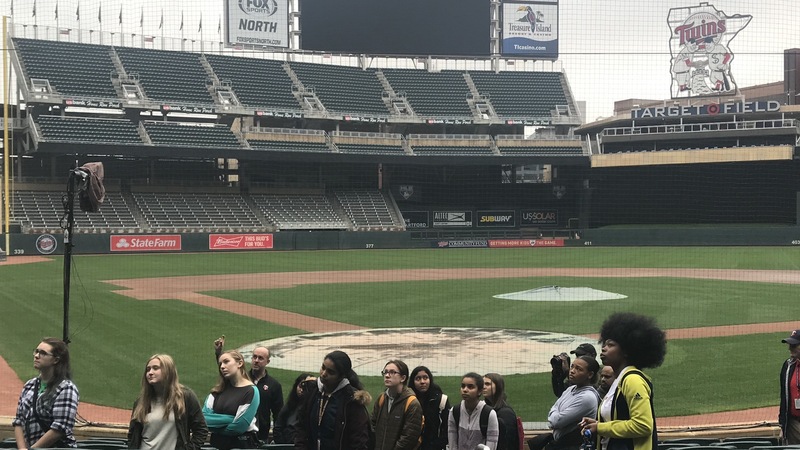 Young women who are passionate about tech took part in an exclusive “behind the scenes” tech tour of Target Field and the Minnesota Twins Baseball Club as part of the Fall 2018 lineup of SPARCS Employer Engagement events. Participants enjoyed an adventure-filled day learning how the Twins and Major League Baseball use technology to ensure fans at the ballpark and everywhere else in Twins Territory love their entertainment experience. This mixture of data reinforces the challenge and opportunities that exist for educators and business leaders to collaborate on talent readiness and recruitment strategies. Clearly, one of the surest strategies to address the existent and expanding I.T. talent gap is to unify forces to ignite the passion and interest of young women in secondary schools to pursue an I.T. career path. As a career exploration strategy, SPARCS learning and networking experiences was first introduced as a complementary Minnesota Aspirations in Computing Awards (MNAiC) program effort in 2014. Since then, numerous employer engagement experiences have exposed hundreds of young women to a myriad of tech roles, companies, entrepreneurs, and professionals who love their work and are interested in guiding the next generation to follow in their footsteps. Shelley Andrew, Twin’s Manager of Business Systems, was the chief architect of the day-long event. She is passionate and committed to exposing young women from diverse backgrounds to a career in tech. Shelley believes hands-on, immersive events like the SPARCS experience are essential for inspiring and sustaining female interests in tech. After their tour and lunch, students were separated into groups, and with professional assistance, tasked with working together to address a problem, and develop a brief presentation using a storyboarding process summarizing their collective learnings to an audience of professionals from the Twin’s organization, business partners and their high school peers. The experience modeled how businesses work in teams to solve problems and create opportunities of shared value. More SPARCS events in 2018-19 are in store for young women in high school with technology learning and career aspirations, with the next stop being Microsoft in Edina on December 18. The new year boasts of events that inspire creative learning and emerging technologies. If you are a business or organization interested in connecting with SPARCS, contact Russell.Fraenkel@metrostate.edu or call 651.253.9438. Starting in 2014, SPARCS learning and networking experiences became a complementary Minnesota Aspirations in Computing Awards (MNAiC) program strategy to inspire and empower young women in secondary schools to Go for IT! Click here to learn more about SPARCS.